COMO - I have other passes, this time for the fooking Kooks (London, 28 September, special gig for Q Magazine anniversary). We used to hate them 2 years ago today on August 30 when Oasis had to perform their last gig ever (but at least there were also the good Kasabian and we had fun with them). Let me know if you're interested. 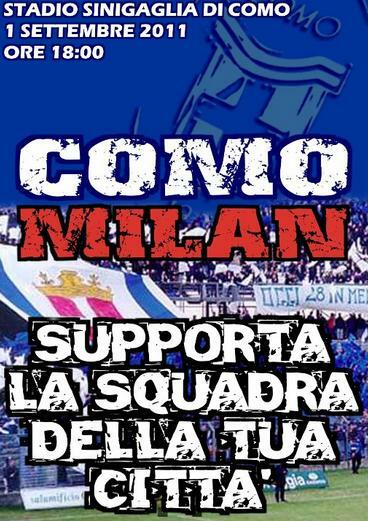 1st September there's a friendly, Como vs AC Milan. Let's see if we can take Liam there, as he's at his beloved lake Como (and beloved restaurant), before leaving for Asia. Come to Como, Liam. Lake of the biggest Italian love story, "the betrothed", with happy ending - unlike Romeo&Juliet in Italy, unhappy ending (that's for Noel's songs). It seems that finally the Serie A league kicks off (after the footballers' STRIKE... incredible, they work too much...), the first game is good, AC Milan-Lazio on Friday 9 September (because they have to play in Barcelona on 13), the other games on 10 and 11. Noooo, breaking news: the great El Shaarawy on loan from AC Milan to Genoa (but then: he stays). Milan needed a player even before, now even more... Mario closer to Milan, it's a pity if he stays @ City without playing.